Planning a trip to Orlando? Head over to Disney Springs for a day and check out the entertainment, shopping and restaurants. 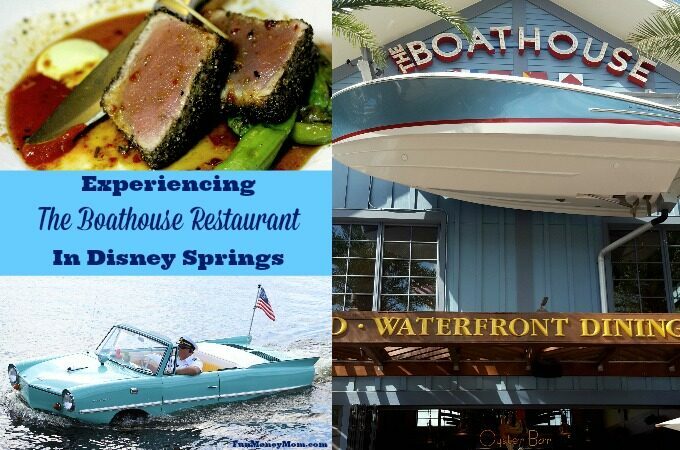 Stop by The Boathouse Restaurant and you’ll get all three of those experiences wrapped into one with delicious food, Amphicar rides and a Boatique filled with fun souvenirs. Thanks so much to The Boathouse for hosting this visit. As always, all opinions are my own. My family has been to Disney Springs a million times (only a slight exaggeration). Every time we visit, my girls want to head over to The Boathouse. 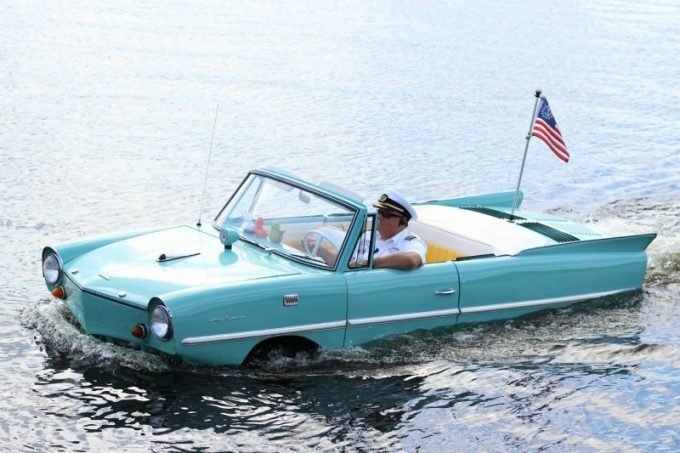 They love watching the Amphicar, half boat/half classic car, splash into the water to take a spin around the lake. I might just be a big kid at heart but I think it’s pretty fun to watch too! I’d visited The Boathouse for drinks before but until recently had never eaten there. However, when my friend Kristie joined me in Orlando for the Disney Social Media Moms Celebration, we decided it was time to check it out. Normally we’re busy moms who spend most of our afternoons driving from one after school activity to another. For one week, we were kid-free and ready to have some fun. 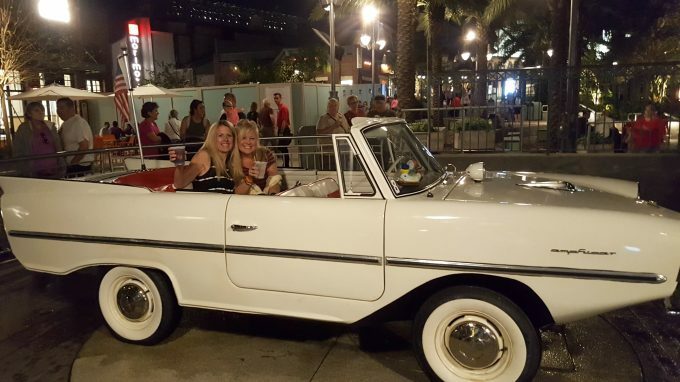 What better way to get the fun started than with a ride in the Amphicar (just don’t tell my girls…they’ll be very jealous). Even better, we were able to bring a couple cocktails along with us. Yes, we were definitely off to a great start! I’m sure that it’s a pretty ride during the day but the bright lights of Disney Springs made for a beautiful nighttime cruise. 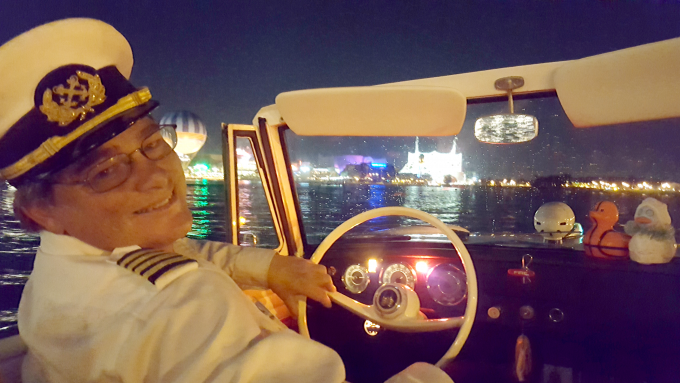 If you’re taking a spin in the Amphicar, you have to ask for Captain Rusty! He was highly entertaining and made sure that we had a great time. Apparently you can also spot him in a couple of the Pirates Of The Caribbean movies and anybody that’s been that close to Johnny Depp has to be cool, right? We hated to leave the Amphicar behind but we were ready for a delicious seafood dinner at The Boathouse! I thought the dining room decor was very well done. From the speedboat in the middle of the dining room to the motors on the wall, you really do get the feeling of being in a boathouse. Though the inside is very nice, a waterside table is the way to go. We selected some wine (they have a good selection to choose from) and chose the Hoison Chili Calamari for an appetizer. It was so good that we ate half of it before I snapped my first picture…oops! It had just the right amount of kick, spicy but not overwhelming. 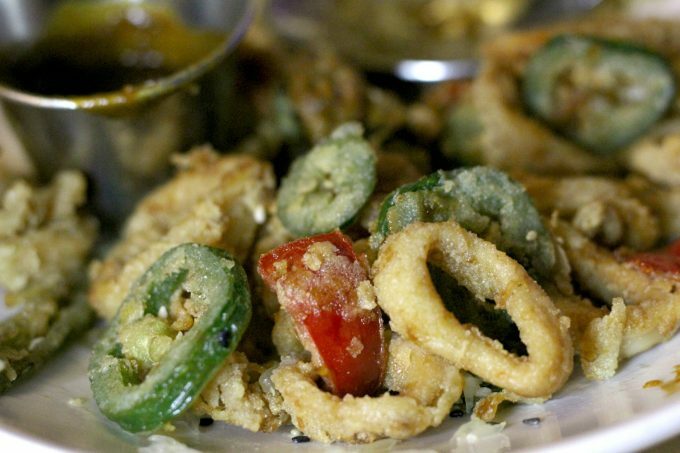 The fried jalapenos were perfect compliment to the calamari and we both thought this appetizer was delish! 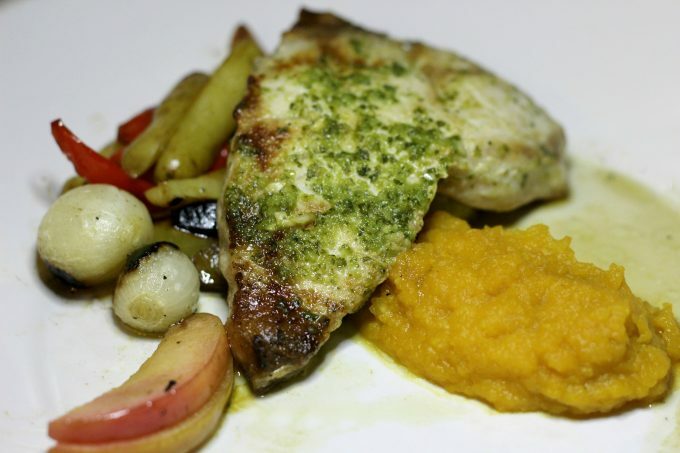 For our entrees, I ordered the Broiled Swordfish Steak with garlic butter, roasted Fuji apples, fingerling potatoes and a delicious butternut puree on the side. I was thoroughly enjoying my meal until I took a bite of Kristie’s Seared Ahi Tuna. Do you ever get that little tinge of regret when someone at the table orders something that you wish you’d ordered? Don’t get me wrong, the swordfish was good but the tuna was excellent. It was perfectly seared with plenty of pink in the middle and just a light drizzle of soy lime vinaigrette. 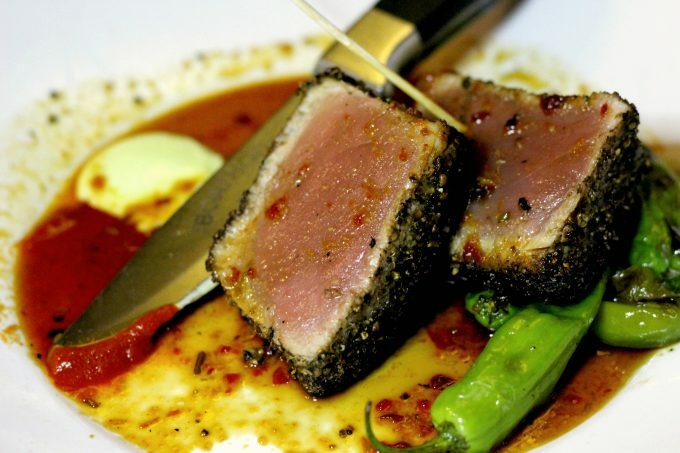 Fresh and flavorful, if you like tuna this is what you want to order when you dine at The Boathouse! It was tough to decide on dessert because everything looked so good. Our waiter helped us narrow our choices down to the the signature S’mores Baked Alaska and the Whiskey Caramel Cornbread Cake. They both came highly recommended but we decided that the Baked Alaska was way too big (it serves four). We went with the cornbread cake and loved it. The cornbread had completely soaked up the the whiskey syrup and when I took a bite, it just melted in my mouth. Combined with the whipped buttermilk and summer fruits, it was an amazing dessert…and I ate way too much of it! I also can’t say enough about the staff. Our waiter gave us great wine and dessert recommendations and came back to check on us regularly. 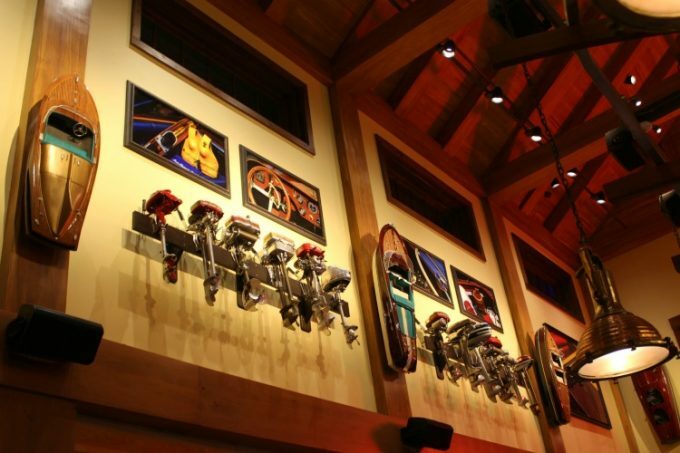 Overall, we found everyone to be helpful and friendly, which made our dining experience that much better. When we finished our meal, we went to check out the Boatique. 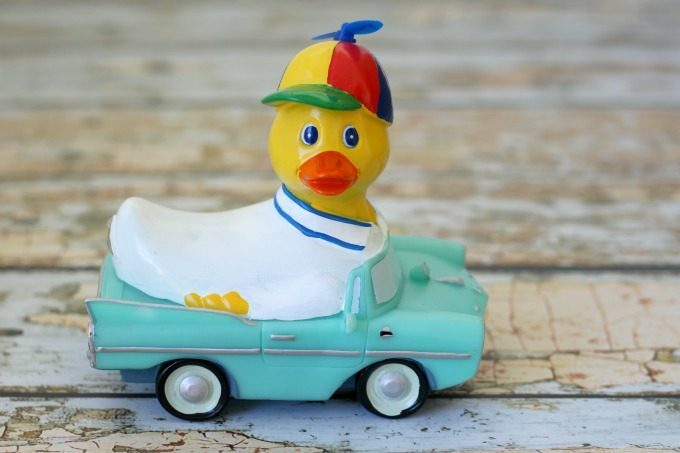 There are lots of fun souvenirs, including this cute Rubber Ducky replica of the Amphicar. I gave it to my 5 year old as a souvenir and it’s now one of her favorite bathtub toys! 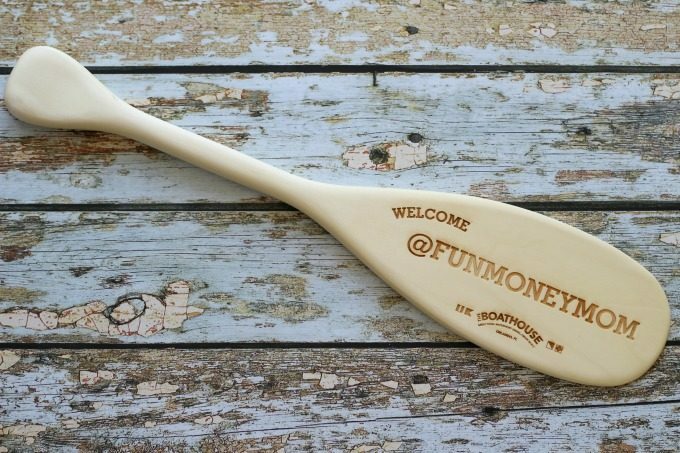 My favorite souvenir was this 24″ personalized oar that you can have made you while you wait. It’s going to look awesome above my desk! 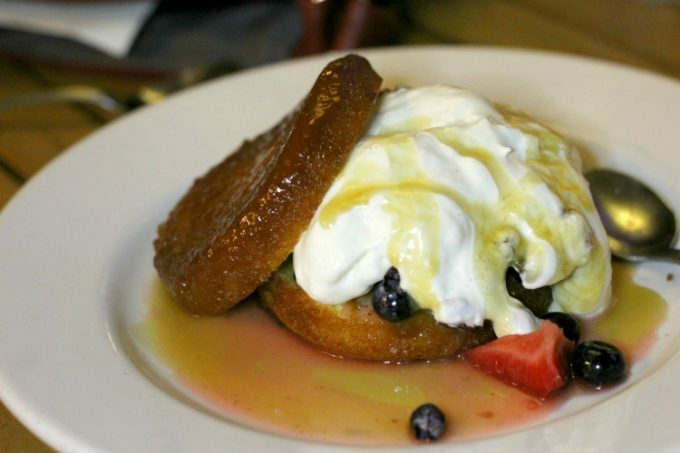 From the Amphicar cruise to the Whiskey Caramel Cornbread Cake, we had a fantastic night out at The Boathouse. Next time you’re in Disney Springs, go check them out! Find out more about The Boathouse by following them on Facebook, Twitter & Instagram. We Celebrate weekends @ Disney Springs Downtown-especially dining during my daughter’s Birthdays! Holiday time was tough but Bathouse staff made it most sensationally FUN & memorable for us always! performed @ MGM on her 5th Birthday with their live cast members! Memorable experiences continue!